Edible soybean, called Edamame in Japan and Mao Dou in China, is grown mainly to harvest the young green-shelled beans for vegetable uses, and not for the matured soybean crops. Most commonly served as an appetizer, the whole pod is steamed or boiled for 3 to 5 minutes until bright green. Then they are drained and while still warm, tossed with salt (preferably kosher or sea salt). The somewhat fuzzy pods contain plump green beans that when you squeeze or bite the bottom of the pod, the beans just pop out. They are fun to eat and are a nutritious alternative to peanuts for snacking. 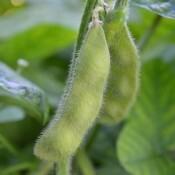 In general, grow soybeans as you would bush beans. Bush beans will usually have few problems, as long as they are planted in fertile soil and cared for properly. They produce a taproot, so they are drought tolerant. Soybeans tend to be pest free and have little disease problems. Suggested companion plants for edamame include corn, cucumbers, potatoes, strawberries, and celery. Edamame is best planted away from any plants in the onion family, such as garlic and onions. To eat, squeeze or bite the bottom of the pod, which will pop out the bean. With their buttery-fresh flavour and crisp-tender texture, edamame can become as addictive as a bowl of peanuts. Edamame is a complete protein providing all nine essential amino acids. Great source of fiber, calcium and vitamins A and B, essential fatty acids, and isoflavins. A half-cup of shelled edamame is about 120 calories. 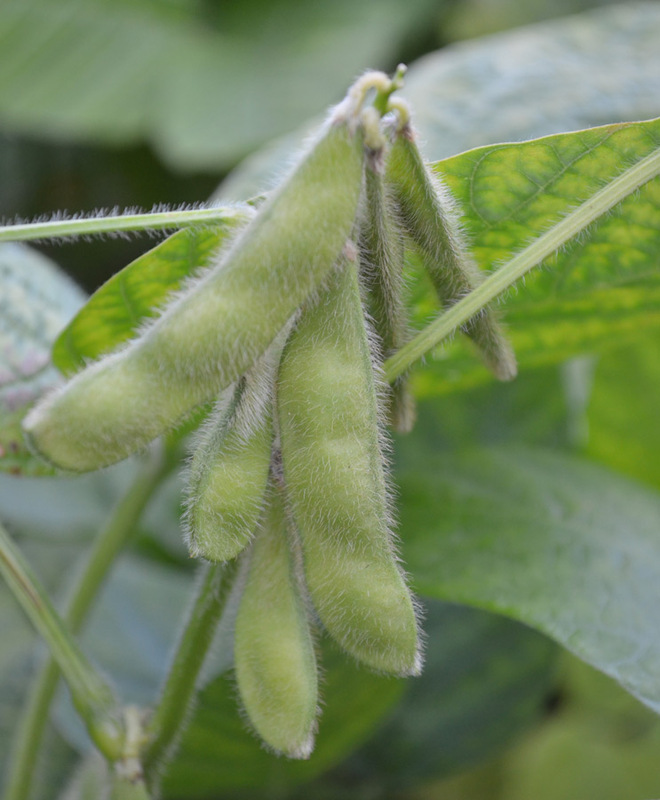 Edible soybean produces clusters of pods with green beans. Pick the pods when they are plump but still green. All pods on the plants are harvested at the same time. For fast, easy harvesting, pull up the entire plant by the roots, turn it upside down, and pull off all the pods. Fresh pods should be stored in a breathable bag at room temperature. To freeze, blanch beans, cool in ice water, drain and freeze.